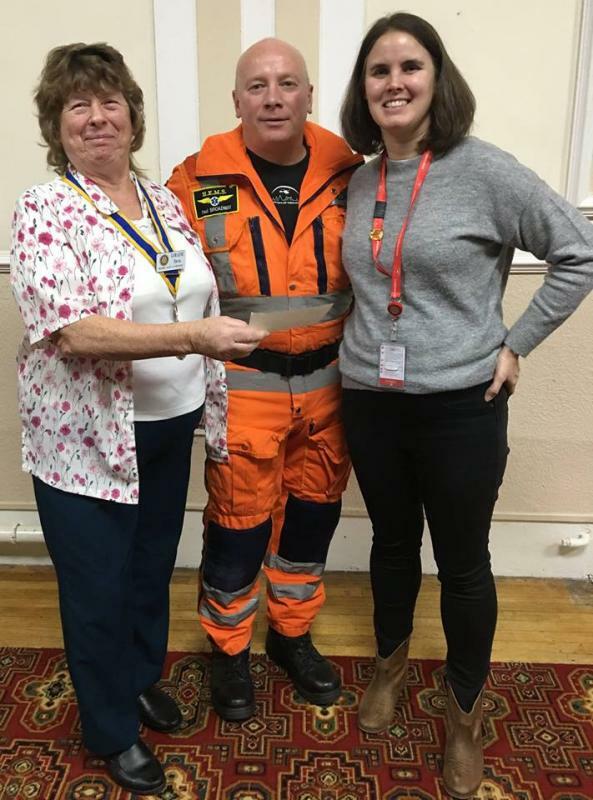 President Loraine Davis is pictured with Lisa Bridge and Paramedic Paul of the London Air Ambulance following their talk on 22 January 2019. The charity London Air Ambulance, this year celebrating its 30th birthday, covers the area within the M25 and deals with 1800 patients each year, five per day. They use two aircraft, which operate during the day, and cars during the night. They told of the wonderful work the organisation does to save lives. The Duke of Cambridge has become Patron of the London Air Ambulance Charity 30th Anniversary Campaign. The campaign aims to highlight the charity’s vital work in delivering life-saving treatment across London, and raise support for the development of new facilities. Through his work as an air ambulance pilot for the East Anglian Air Ambulance, The Duke has seen first-hand the impact these first responders have upon the lives of patients with critical injuries. As Patron of the 30th Anniversary Campaign, The Duke will champion those working on the frontline, and highlight the importance of the London Air Ambulance’s vital work.